Based on the popular British version of Top Gear, Top Gear Australia looks to give a unique Aussie spin on the car scene while still having all thrills and spills that we all love. Plus there is the Stig's Australian cousin. What more could we ask for! 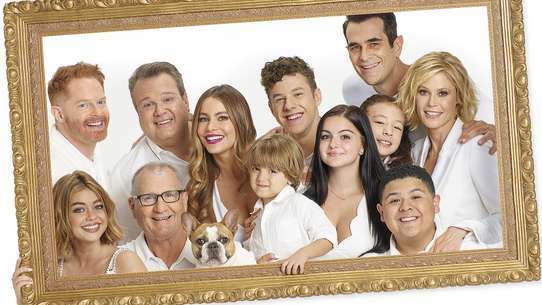 In 2010 the show moved from SBS to the Nine Network. 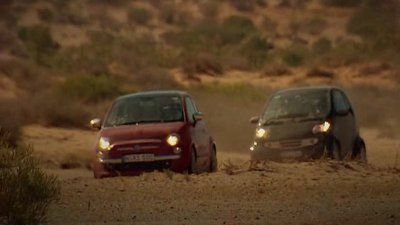 We find out which cars pull chicks, Steve and Warren challenge the city dwelling Fiat 500 and Smart Fortwo to one of the toughest off-road tracks in the world and a new Nissan Patrol is put up against a 1979 Toyota Landcruiser in a series of tests. Gary Sweet is the Star in the Bog Standard Car. Steve takes the Holden HSV Clubsport R8 around the Top Gear test track putting it up against it’s big brother, the Superclubby. 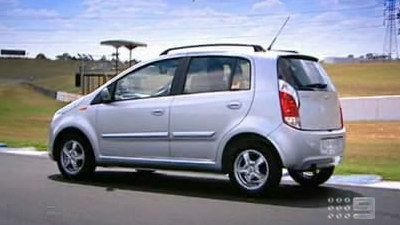 Steve and Warren take two cheap petrol cars turning them into Electric cars; Steve takes a Suzuki Mighty Boy gluing in 4 battery powered drills and Warren takes a V8 HZ Holden Kingswood installing 300kgs worth of batteries and an electric motor. Warren teaches Steve how to drive a Ford Model T and Ian Moss is our star in the bog standard car. 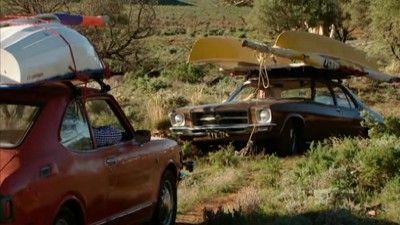 Charlie Cox, Warren Brown and Steve Pizzati are each given free reign to pick the car of their choice for a weekend road trip through the Apple Isle. Meeting at the Spirit of Tasmania departure point in Port Melbourne the lads arrive in style - Charlie in a Porsche 911 Turbo, for Warren, a Bond fan, it's the Aston Martin DB9 and Steve saddles up the Lamborghini Superleggera. Once across the Strait, they take off for the ultimate boys and their toys weekend away. With closed roads and assistance from the team that operates one of the world's best tarmac rallies - Targa Tasmania - Top Gear Australia negotiates the luxury sports cars along the long and winding deserted roads in the pristine wilderness of Tasmania's West Coast. Then it's Holden versus Ford take two and this time we answer the all important question. 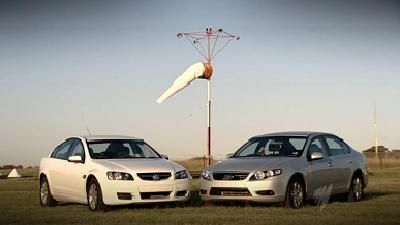 After taking a look at the performance vehicles earlier in the series, Top Gear Australia goes back to basics with these iconic brands and compares the entry-level Commodore Omega and Falcon XT on the test track to see how they stack up. Will the Ford be favoured or will the lion roar? Also, Charlie test drives the new stylish Jaguar XF SV8. Excited about the 'surprise and delight' features in the new luxurious sports Jaguar, Charlie compares the features to the older unreliable models. "In the old days with Jags, you were surprised and delighted if it started". Award winning actress, Claudia Karvan (Love My Way) is the final Celebrity in the Bog Standard Car for series one. 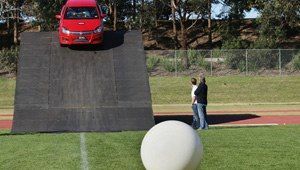 The popular actress admitted to Charlie that she wanted to beat her The Secret Life of Us on-screen husband, Vince Colosimo on the lap board and joked that doing her hotlap on the Top Gear Australia test track was better than winning a Logie. James test drives the new Nissan 370Z and then travels to Los Angeles to drive the Australian built Pontiac G8 GXP. Warren sets out to build a ride on lawnmower from a Toyota Hilux Ute for under $4,000 and Amanda Keller is our Star in the Bog Standard Car. 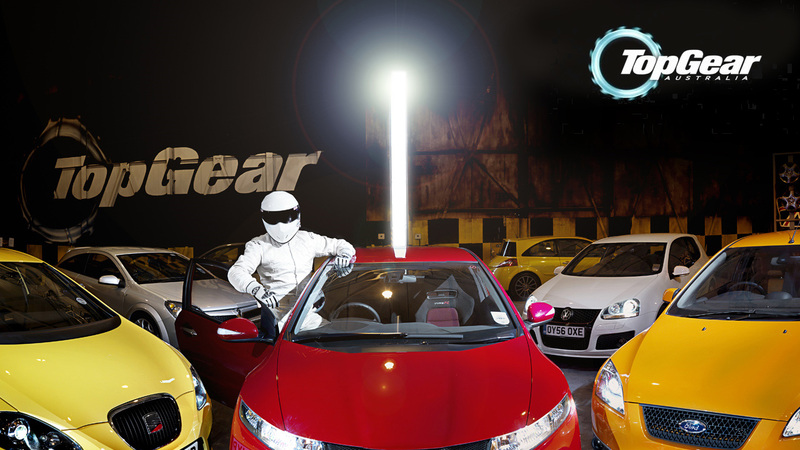 Top Gear is back - bigger, brighter and faster than ever. 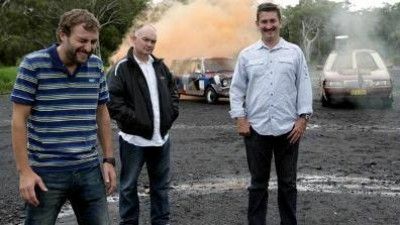 Shane, Steve and Ewen add some spice to rally driving by introducing a dangerous twist: blindfolding the driver. Ewen declares his long-held dirty secret: he loves Volvos. Plus, Ewen and Shane head out to review the new Toyota iconic FJ Cruiser, and six-time world champion surfer Layne Beachley attempts to break a world record. Also special guest Andy Lee. It's a review with a difference as Subaru's latest weapon shows its strength against the military's secret airborne attack asset. 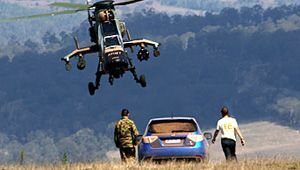 Known for excelling at "going about as fast as they can from point to point cross country" Steve has asked the Army to indulge in a search and destroy mission with the Tiger Armed Reconnaissance Helicopter against his rally driving skills in the WRX STI. 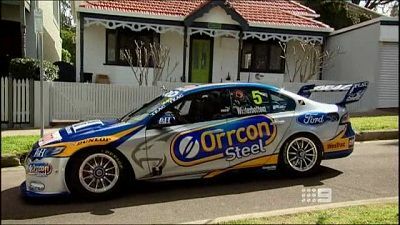 Then V8 Supercars drivers and Bathurst 1000 podium place winners, Greg Murphy in second and James Courtney in third, take their super fierce competitiveness from Mount Panorama to the Top Gear Australia test track. This time it's not Holden versus Ford, it's man versus man as they race the "Bog Standard Car" like it's never been driven before. Who will be crowned King of the Proton? Also, is diesel a better, more efficient fuel than petrol? With skyrocketing petrol prices affecting the pockets of drivers countrywide, Top Gear Australia gave Charlie and Warren identical Volkswagen Golfs with only one difference, one is powered by diesel the other petrol. 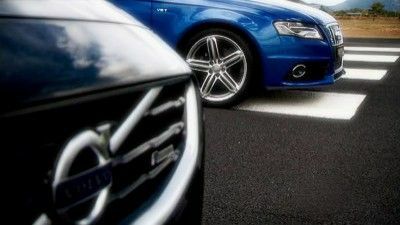 It's diesel versus petrol, and every man for themself, as they take to the roads to find out which is more economical and which is faster. And Steve falls in love with the Nissan GTR R-35 supercar. "I just love it! ... It might be as polite as a Japanese waiter but press the right button and she's a samurai." The Top Gear team attempt to turn three every day cars into Armoured Limousins and Steve test drives the Elfin T5 and its big brother the Streamliner MS8. HG Nelson is the Star in the Bog Standard Car. We celebrate the 75th birthday of the UTE in natural Top Gear style, by taking hammers and an angle grinder to two cars; a Honda Prelude and Toyota Tarago. 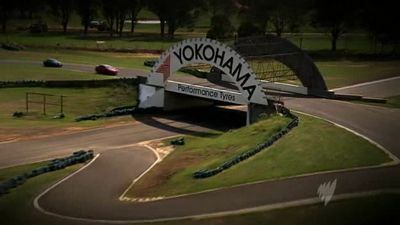 Warren takes the Maserati GTS around the Top Gear Australia test track, James is sent to Stunt driving school and Ahh Doh is the Star in a bog standard car. Warren takes on a horse, Man from Snowy River style, with a Porsche Cayenne Diesel to prove which is better - horse power or a horse. Steve wins the right to review the Ford Falcon GTHO. James and Warren check out the Mercedes S-Class and Lexus LS. Gyton Grantley is the Star in a Bog Standard Car. 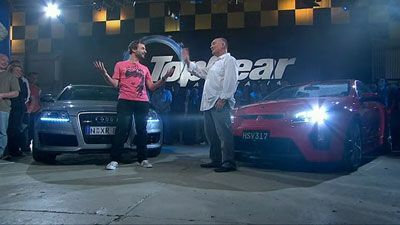 Top Gear Australia welcomes their new co-Host James Morrison and for his first order of business he test drives the Mitsubishi Lancer Ralliart Evolution X. Steve tries to take him down a peg by racing against him in the BMW 135i. 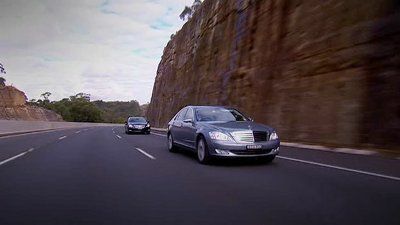 The Long Weekend Challenge takes the Top Gear Team to Melbourne where they will race to Portsea. Steve takes a Lamborghini Murcielago LP640 across land where Warren and James take a Supercharged Jet Ski across Port Phillip Bay. Mark Skafie becomes the new leader of the Stars in the bog standard car. 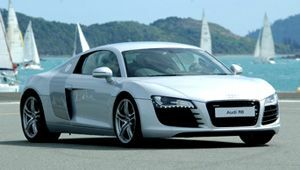 The Audi R8 is claimed to be the 'practical supercar'. "It looks like a nuclear powered supercar but it's really practical," said Charlie. "It's like a non-threatening scud missile, safe explosives, or user friendly hand grenade." His 'Top Gun' moment blasting down the tar mac leaves little debate on the issue. While in town the lads also enter their DIY style amphibious masterpiece in Hamilton Island's prestigious Audi Race Week. Getting into the spirit of the week-long sailing event, the lads get busy converting their own Audi into a road and seafaring machine. Enter the NautiCar or as the lads dubbed it - the Audi H2O. But will it sink or swim? Warren and Steve stretch the 'Toorak Tractor' phenomenon to its limit. 4WDs are meant for the bush but they're so common in affluent suburbs they've become known as 'Toorak Tractors'. 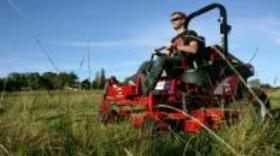 How will Toorak react to a real tractor as a shopping and commuting vehicle? Steve also checks out the sporty BMW 135 Coupé. 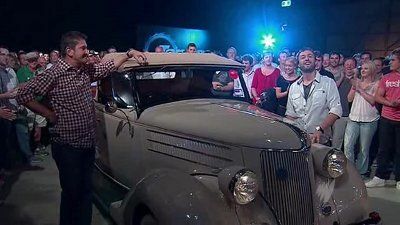 And Australia's favourite Idol, Shannon Noll (What About Me, Drive, Loud), is the "Celebrity in a Bog Standard Car". It's a once and for all 4WD showdown and to the victor goes the spoils - exclusive dinner party bragging rights. 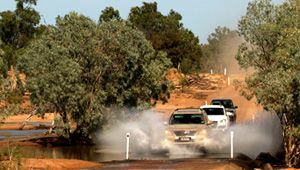 The TGA team are bound for Cairns in north Queensland after starting out in central Australia to settle which 4WD can go the distance. “I have been to a tonne of dinner parties where people have said “My 4WD is good enough to go to Kakadu if I wanted to”. Now everybody knows that they probably never will so we thought we would help with bragging rights for the next party,” said Steve Pizzati. Charlie opts for the luxurious Lexus LX 570, Warren sides with the very capable Range Rover Vogue TDV8, and Steve feels the power of Audi's Q7. It's a 2,400kms test drive for the record books as the lads set out from Alice Springs on a seven night stint under the stars and along the open desert planes - their sanity is sure to be the first victim. Not a fan of being one with nature, Charlie said, “When I was a kid about 12 years old on the family camping holidays I used to lie back at night and look back the stars and think to myself “When I grow up I am going to get really rich so I never have to go camping again”.” Also around the streets of Sydney, Charlie takes the sporty Mercedes SL 63 AMG for a cruise, “A car this stylish can even make a mug like me look good, well not that bad anyway.” Car enthusiast, James Morrison, talks to Top Gear Australia about meeting his wife in a celebrity car race, owning 96 cars and his goal to beat Julia Zemiro on the lap time leader board. Whose car is the best? Fastest? Coolest? Strongest? 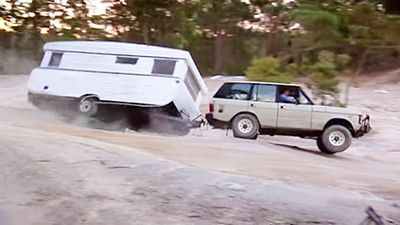 Well there's only one way to settle this - a Top Gear Australia challenge. The lads and their precious motoring masterpieces assemble at Oran Park for a race showdown. By the end of the day - a star will be born, and egos bruised. Then the world's first Sports Activity Coupé, the revolutionary BMW X6 Coupé 4WD, is put through its paces. Is it a visionary triumph or an impressive blunder? Warren takes a drive to find out. 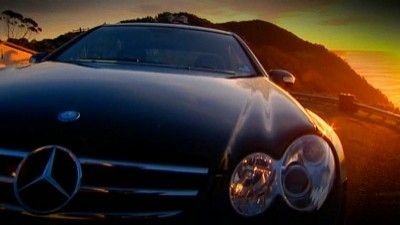 Steve Pizzati reviews the F1-inspired Mercedes CLK 63 AMG Black Series coupe and SBS's own delightfully hilarious hostess, Julia Zemiro (RocKwiz), is the "Celebrity in a Bog Standard Car". Steve test drives the AUDI RS6 and the Holden HSV Wagon. Olympic gold medallist Leisel Jones is our Star in the Bog Standard car and the team tries to find some un-drift able cars. This episode the crew re-traces the steps of David Norrish. In 1974, when northern Australia experienced a once-in-500-year weather event, and the river flow from such heavy rainfall caused Lake Eyre in South Australia to fill with water, Norrish packed a boat on the roof of his Kingswood and set off for a spot of outback sailing. The first celebrity in this new season is Lisa McCune. Steve explains the changes they've made to the test track, and Shane Warne drops in for a high-speed blast in the Morgan Aero Supersports. In the toughest test the show has ever undertaken on a car, Steve, Ewen and Shane take Australia's cheapest new vehicle, the Chinese-built Chery, and drive it flat out for 24 hours to replicate 10 years of ordinary wear and tear. Shane, Ewen and Steve have a budget Grey Nomad experience. 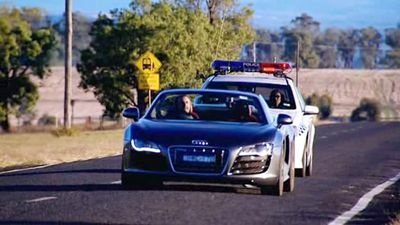 Shane Warne drives the world's fastest supercar, and the celebrity guests are The Chaser's Andrew Hansen and Craig Reucassel. In an attempt to understand the inner workings of the cyclist mind, Ewen dons the lycra, waxes the legs and takes to the road and footpaths in what he dubs a "self-help video for cyclists". Plus, will Hamish Blake top his colleague's lap time from last week? And the boys cook up a storm using a jet-powered car. 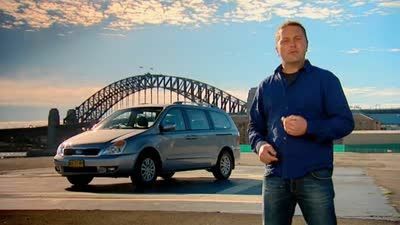 Cricketer Michael Clarke takes on the test track, Ewen stops city traffic in a V8 supercar, and the boys meet their match on New Zealand's most dangerous road. #24 - Ford vs Holden! It just wouldn't be Australian if the lads did not delve into the great debate that has divided the nation for decades - Holden or Ford? So Charlie and Steve take the HSV Clubsport and Ford FPV F6 to Wakefield Park for the ultimate test drive to settle the argument once and for all. Then Top Gear Australia shuts down the biggest open pit gold mine in the country, the Kalgoorlie Super Pit, to get its hands dirty. In the toughest ute challenge, Charlie, Warren and Steve test their ute of choice in a race against time and The Stig. After surviving his stint as human shark bait in episode one, Warren "Why is it every episode of Top Gear I nearly get killed?" Brown, in preparation for his next outlandish idea, convinces Steve to convert a Smart Car into a hearse for under $200. While the two load a coffin into their new budget Smart Hearse and take it for a test drive, Charlie spends his time slipping into something a lot faster and much cooler - the Ford GT Supercar. As the studio guest, Australian actor, Steve Bisley (Mad Max, Water Rats), will attempt to knock Vince Colosimo off the celebrity Lap Time leader board. The ramp is set – the jack in place – and the kettle is on! Our fearless hosts step into a world of scones, walking sticks, and shoes with zippers. There is little margin for error, or bright colours for that matter, in this age old sport. Yet roling an Astra down a steel ramp and steering from the passenger seat is not as easy as it looks. By the end of the day there is a special sub-committee established by Warren to investigate the stolen over-sized novelty jack. From the grassy flats of lawn bowls to the open plains of the outback, the lads pit satellite navigation against Aboriginal tracking skills. Warren will have to rely on his tracker, Diesel with trusty steed Ned, while Steve guides a Toyota HiLux TRD fitted with Follow Me GPS through the picturesque Home Valley Station in remote Western Australia. Who will become champion of the outback and conquer the land before nightfall? Steve Pizzati takes the HSV W427 for a raging spin around Holden’s mysterious ‘Proving Ground’ in Lang Lang, Victoria. Track limit: 250kph. Heart rate limit: unrestricted! And, iconic Australian actor Jack Thompson (the soon to be released Australia, Breaker Morant, Sum of Us) is our weekly “Celebrity in a Bog Standard Car”.